View of Mt. Zion from the Moses Montefiore Windmill. Photograph by the author. Last month, Samantha and I went to Israel. It was my first time in the country and my first visit to the Holy Land. I was struck by the conundrum that is Israel. On the one hand, there is the history of the land and the history on the land. Three of the world’s major religions were built from the earth there and sprouted and diverged as any people do, resulting in conflict and misunderstanding. On the other hand, there is evidence of these religious factions co-existing much like that bumper sticker popular a few years ago featuring the message “Co-Exist” and a pantheon of religious symbols, as if to ask, can’t we all just “get along”? In Old Jaffa, south of Tel Aviv, for instance, ancient mosques and churches and synagogues sit cheek by jowl along the sea approach. And the market in Jerusalem is filled with Muslim and Jewish merchants distinguished perhaps only by their working hours and some specific merchandise. Concurrent with this trip, Samantha asked me to write a poem to serve as the peace prayer at her daughter, Erica’s Bat Mitzvah, which happens to be this weekend. I was honored that not only Samantha, but my stepdaughter, too, wanted me to participate in her special day. I’d been thinking about the subject on my first days in Israel, much of which was spent on my own as Samantha was in a conference. 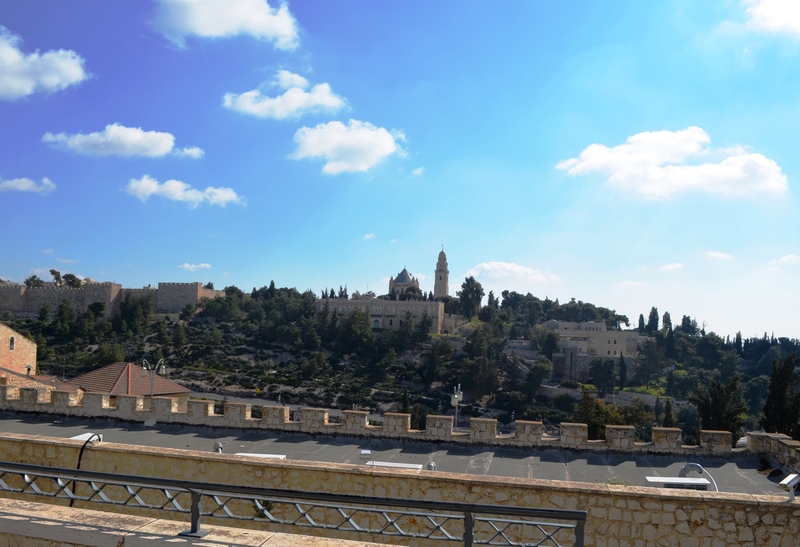 But it wasn’t until our last day, in Jerusalem, when a tour guide we’d hired read a poem of Yehuda Amichai’s called “An Arab Shepherd is Searching for His Goat on Mt. Zion,” as we stood on a hill under the Moses Montefiore windmill overlooking Mt. Zion, that a poem started to come to me. and a child on Mt. Zion. –cradle and shelter of all origins. hiding together among the bushes. echoing over centuries of stone.